Ivory Brown is a Natural material. Ivory Brown is a Medium priced Granite stone. 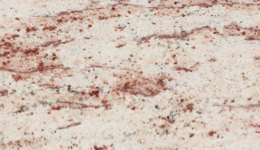 Ivory Brown is a very light granite with pink, cream, brown, red and some black in it. This timeless material has a lovely warmth to it that will look great in any traditional kitchen and even suits some modern kitchen styles. Ivory Brown is well suited to many bathroom styles and makes stunning vanity tops. We highly recommend that you choose your own slab of Ivory Fantasy as each slab is quite unique. Ivory Brown is a Natural Granite from India, Landford Stone offer this type of stone in a variety of thicknesses and finishes. Ivory Brown is a Medium priced stone and will look incredible in your home!